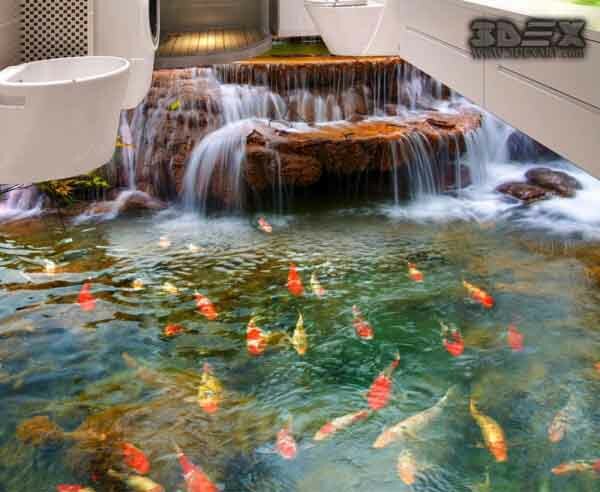 What is the 3D tile flooring? 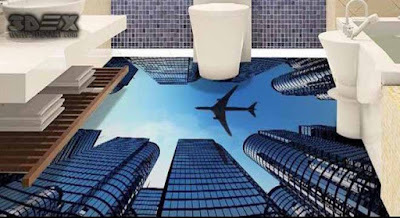 An image painted on a ceramic tile of high quality with a perspective. The image itself, like the 3D tiles, in this case, is flat, but the high quality of the printing plus the polymer coating applied from above create the illusion of volume. An example of such 3D tile flooring can be ceramic panels with palm trees on the seashore or a night city view. A glass stereo wire. 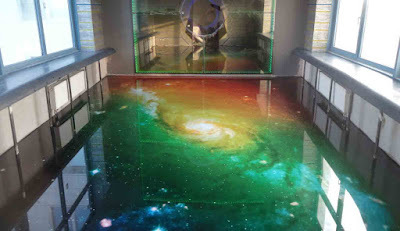 On the hot glass, a specially processed image is applied and depending on your position in space, the image changes. An example of such an image may be the rotating gear of a clockwork or a tiger looking in your direction. Tile and mosaic, which has a pronounced relief. Such a tile can be made in the form of hemispheres, uneven bricks, craters, etc. 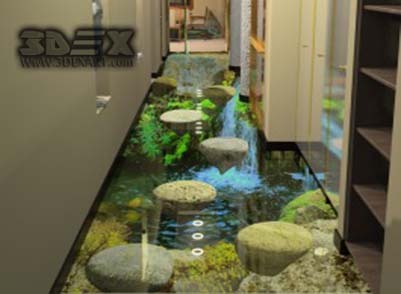 Let's take a closer look at the first, second and third options 3D floor tile designs offer. 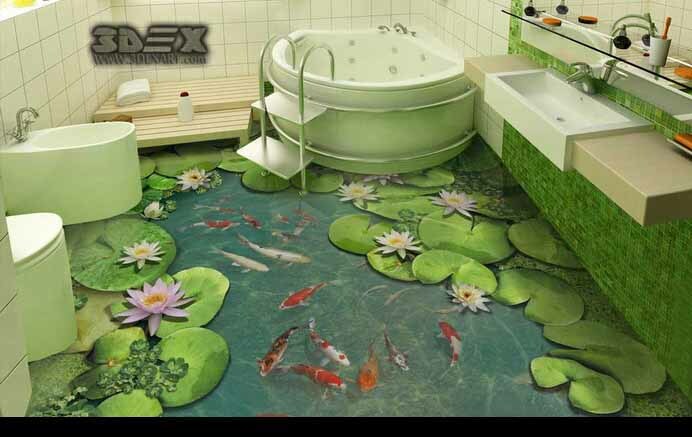 Ceramic 3D floor tile designs are often used to decorate the floors of bathrooms and pools. Hence there’s an abundance of images of water themes as coral reefs, oceanic islands or seabed. In the kitchen, you can use flowers, landscapes and any other 3D panels combined with a common interior solution. 3D Ceramic tiles are often used for finishing office premises, cafes or shops. Large paintings visually make a small room even smaller. Therefore, if the bathroom is tight and its area is small, it’s better to use a classic tile that’s monophonic or has a small ornament. If you still want to use an unusual artistic decor, let it be a small image on one of the walls or curb. Be careful with pictures of people and animals. 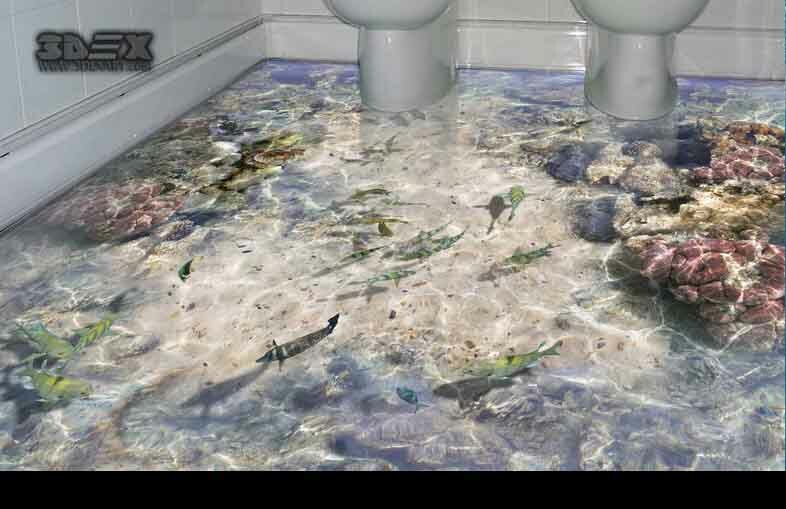 Such 3D tile flooring can quickly get boring. The same applies to bright contrast elements. 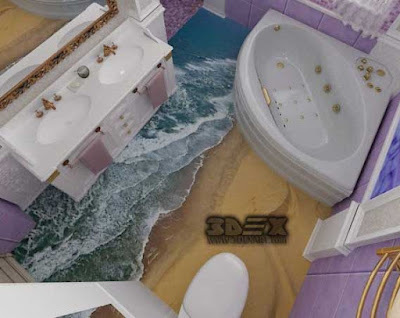 If you have chosen a 3D bathroom tile for your bathroom design, make sure that the room contains a minimum number of items and accessories. 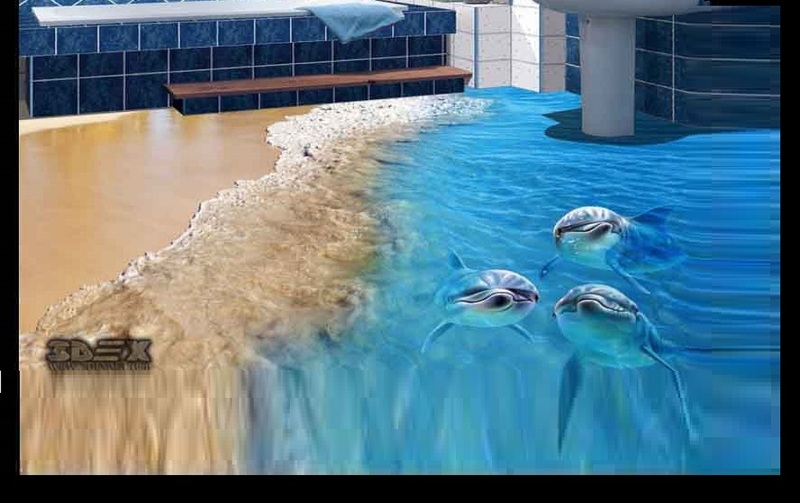 The basket with linens against a background of frolicking dolphins in the water looks somewhat alienated. Try to make sure that the image is not close. It’s worth saying a few words about the technology of making 3D bathroom floor tiles and that it has its practical properties. After all, this is a finishing material, and therefore the value is not only the appearance, but also the quality, durability, and resistance to external influences. For example, they should be particularly strong. There are several methods of applying and fixing an image. Sublimation. 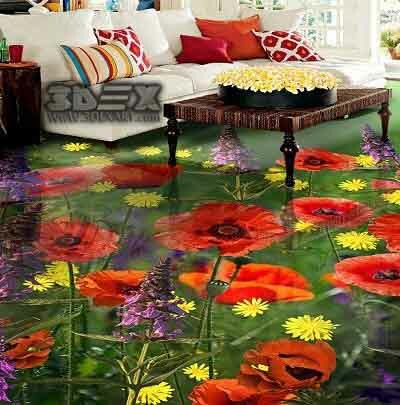 The image is printed on photo paper and then coated with a special polymer tile. Fastening occurs under the influence of pressure and high temperatures. Sublimation is the most common and inexpensive way of printing. However, it has several limitations. 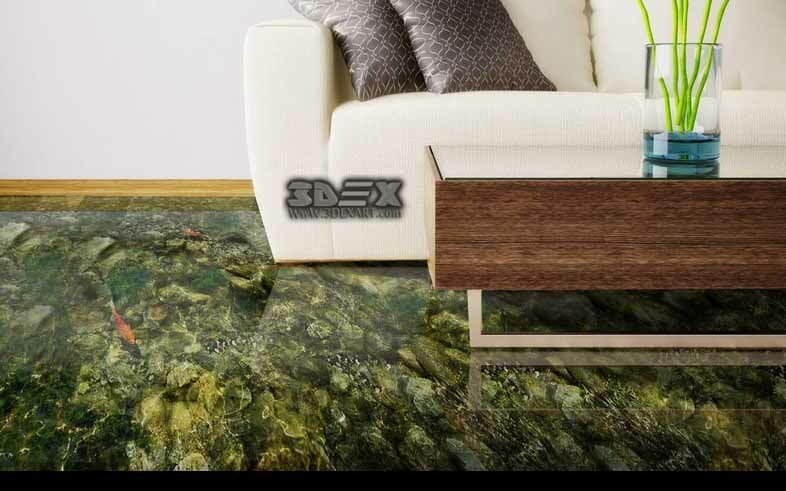 3D tiles manufactured in this way are suitable only for indoor use. They don’t go well with abrasive detergents, so it's best not to use them, say, in the kitchen over the stove. 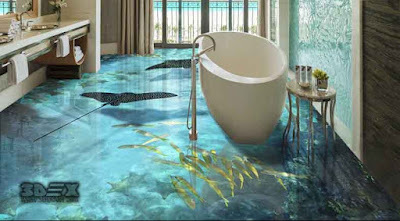 The ideal place to use these 3D flooring tiles is a bathroom, a swimming pool, a living room or an office. Decal. The image is pre-applied to paper, and then peeled off from it in a special way and transferred to a 3D tile. 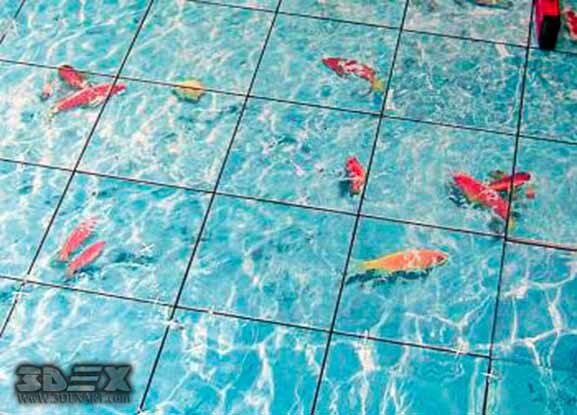 Under the influence of high temperature, the dye penetrates the ceramic from above the tile which is covered with a fixing layer. The image stability is largely determined by the firing temperature. This technique of drawing a picture on 3D bathroom tiles is considered the most laborious. This directly affects the value of the goods. The product has a pronounced glossy sheen and is resistant to temperature changes and chemical agents. UV printing. This technology implies the drying of the ink under the action of ultraviolet rays. After applying the image, the 3D tile is additionally covered with a protective varnish and fired. This type of printing is considered the most modern. It allows you to achieve greater image stability and reduce production time and therefore the cost of the finished product. 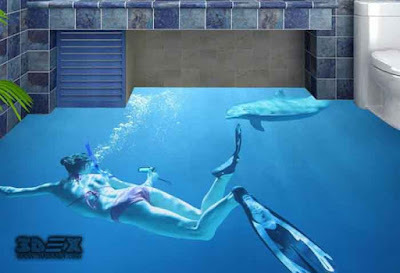 Such 3D panels can be used not only for internal premises but also, say, on the facades of buildings. 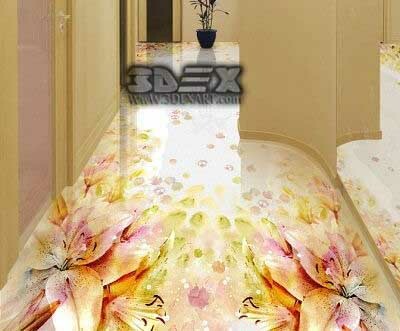 An important feature of ceramic 3D tiles is that it can’t be cut like a regular tile. 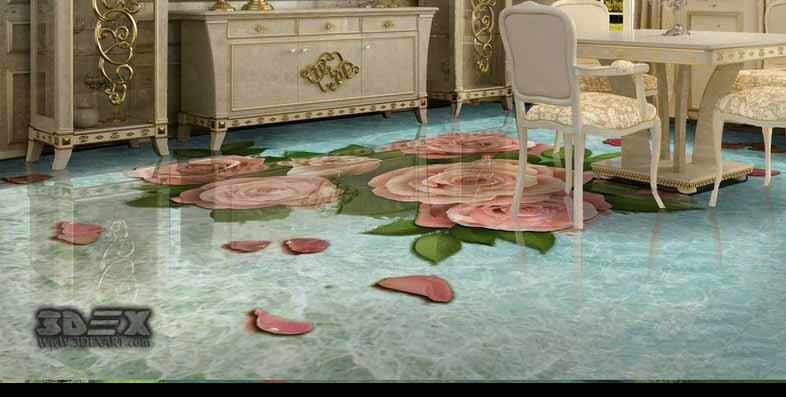 Breaking the integrity of the tile, we inevitably deteriorate its decorative and practical properties. You need to buy the material considering how the 3D panel is fully fit on the floor. The surface for mounting such a tile should be completely flat. 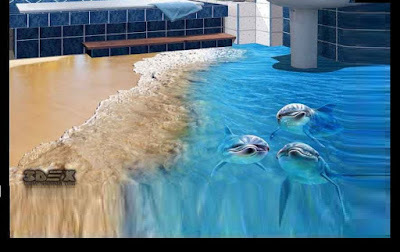 Otherwise, the integrity of the drawing will suffer, and the 3D flooring image will look messy. 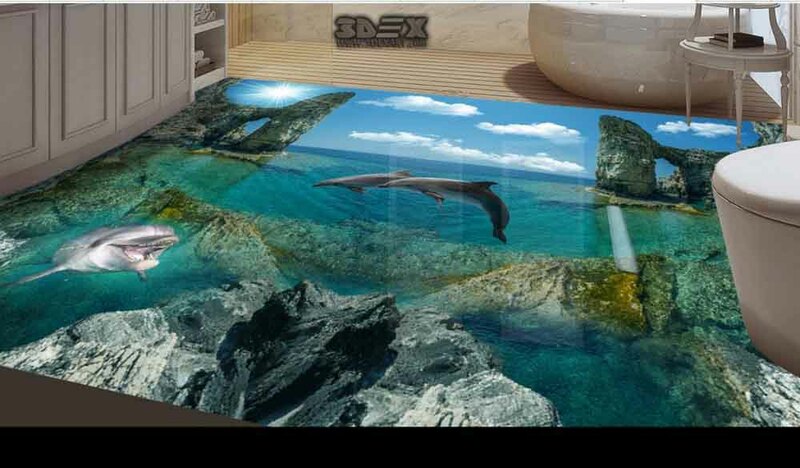 Laying 3D bathroom floor tiles is done using the same technology as conventional ceramic. After all, it's the same tile, just with a few extra layers on top. To smooth the joints, a colorless silicone sealant is used. 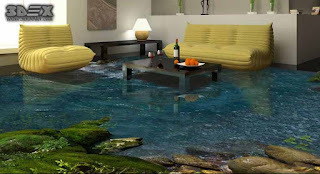 3D tile flooring differs in strength and resistance to abrasion. Therefore, when choosing a 3D floor tile, don’t forget to check with the seller whether the material you’ve chosen is suitable for these purposes. This is a relatively new product for the market for finishing materials. 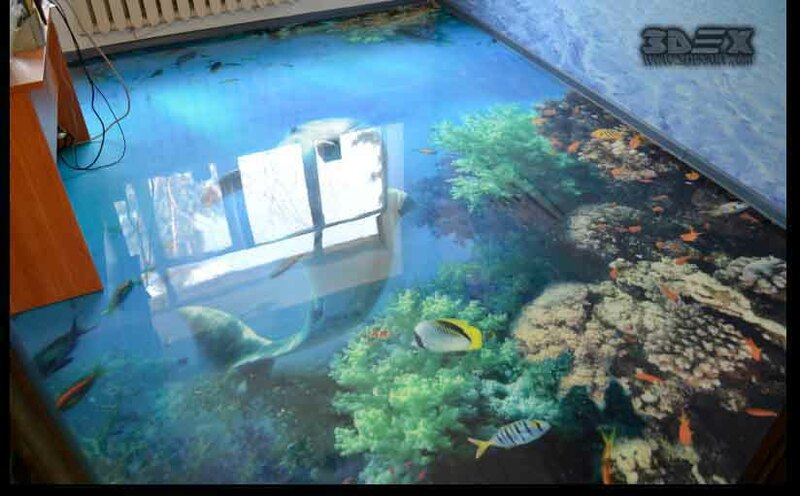 The 3D tile is made of tempered glass, on which a specially processed image is applied from the back. The surface is made using micro-lens technology, which gives the 3D wall panel a stereo effect. What differs the glass 3D wall panels from ceramic 3D tiles is that the image on the glass moves depending on the observer’s position and movement. 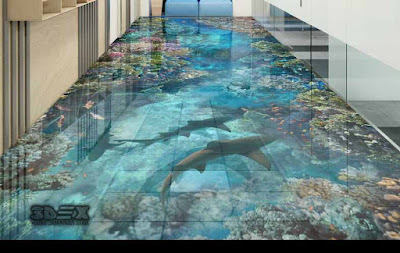 Manufacturers of 3D glass tiles assure that it’s stronger than ceramic and that it easily withstands the effects of chemicals and temperature changes. The only thing that this material can’t take is strikes on the side edges. 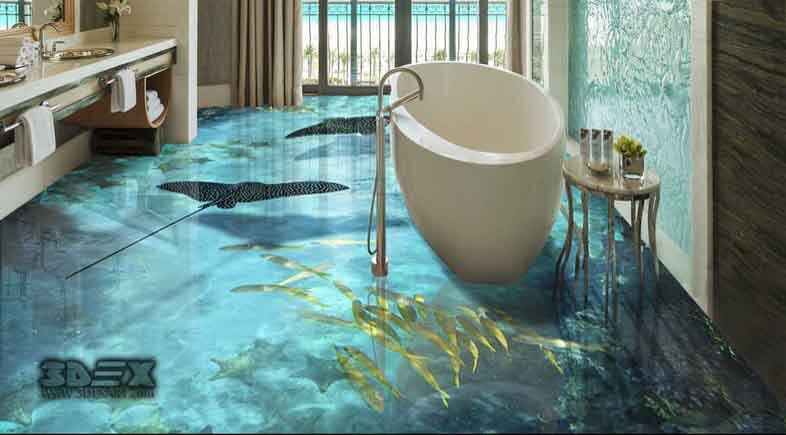 Embossed or 3D tile flooring is a real classic in interior design. It can be either large-format or in the form of a very small mosaic (a mosaic is also made of glass). Such material can have absolutely any texture from geometrical ornament, blocks or hemispheres to plant patterns or flowers. The surface can be glossy or matt and rough. 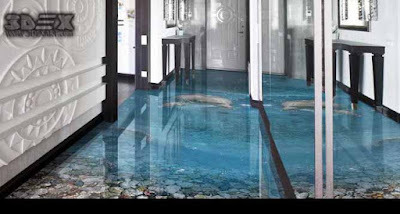 When choosing 3D tile flooring design for the interior of a private house, you should know that the more relief and rough surface the material has, the more difficult it is to remove contaminants from it. Therefore, for bathrooms and kitchens, glossy collections with a round or brick-imitating decor are better. For living rooms and commercial or office premises, you can use any invoices. The relief wall decor gives the interior a special charm, however, it can visually narrow the room. Therefore, 3D wall tiles for a bathroom of a small size should be applied in a dosage. You can make, for example, a relief border or a panel. 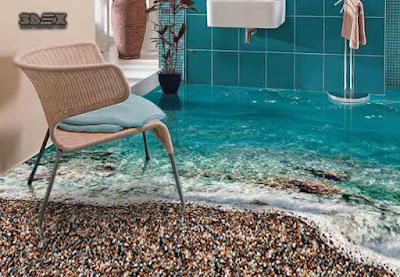 But in a spacious bath with such a coating, you can safely trim the whole wall. 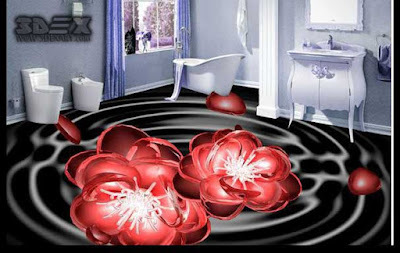 3D wall or floor tiles for the bathroom can have both a classic and completely fantastic design. 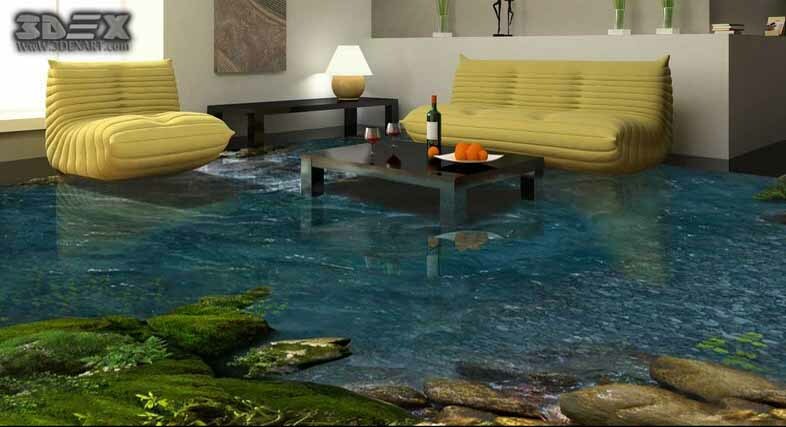 3D tile floors or walls can be used alone or as an accent on the background of traditional smooth tiles. Stylistics of collections can be classical, retro or, on the contrary, ultramodern. The choice is truly huge.